In the heart of Bigouden and Cornouaille, just 2km from the beach, Camping Kerlaz *** welcomes you for a family holiday. Enjoy our indoor heated pool and evening entertainment for you and your family, and our club that will welcome your children to entertain them. The pool is open from 15/04 to 30/09. You can also play table tennis or pétanque. For your comfort, many services are at your disposal: wifi access, laundry, bar, snack. Mobil Home 2 Rooms 2 People of about 20m ² composed of a separated living room, a dining room, a corner cooks, a room with bed 2 places, a room of water with TOILET and d 'a terrace of 8m ². 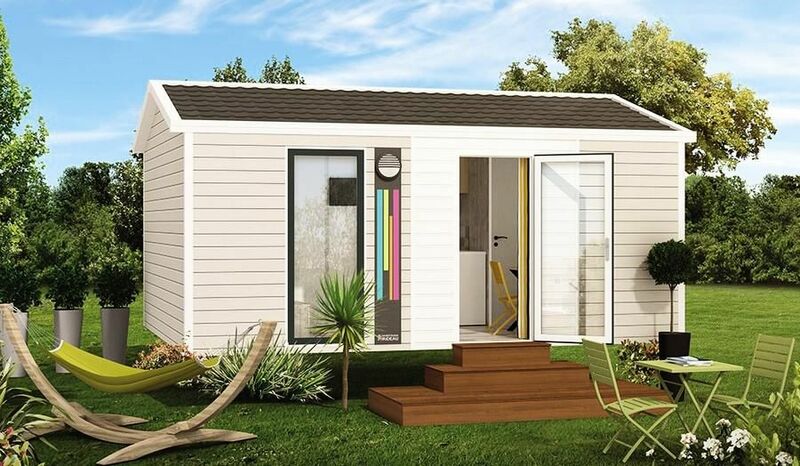 The Mobil-Home includes a living room convector, a kitchenette equipped with fridge, hotplates, microwave, coffee maker, kettle and crockery adapted to the number of people. The terrace has a garden furniture with 2 chairs. The duvets and pillows are provided. From Paris: Motorway A 10 direction Nantes / Bordeaux. In Dourdan, take the A11 motorway towards Nantes. At Le Mans, take the A 81 motorway towards Laval-Rennes. Continue on the RN 157 until Rennes, then direction Lorient by Ploërmel on the RN 24. In Hennebont, follow the RN 165 towards Quimper / Brest.